The Ecosse HIU from Herz is suitable for all community heating schemes and enables LTHW from a central plant to provide heating and DHWS (if required) to each dwelling with complete hydraulic separation between the LTHW primary and secondary heating and storage type DHW systems. 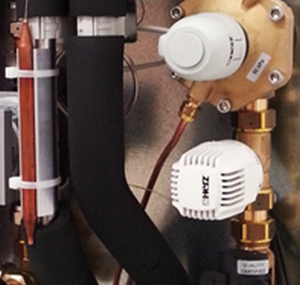 The HIU has a single heat exchanger providing heated water. The heating supply from the HIU can be utilised for space heating and DHW cylinder storage in an “S Plan” configuration if required, or alternatively can be used for single use, either for space heating or for DHW storage systems. The primary heating temperature is controlled by a Herz temperature limiting valve located in the return. A Herz fixed spring differential pressure control valve is also fitted as an integral part of the HIU to protect the temperature limiting valve and govern flow rate. 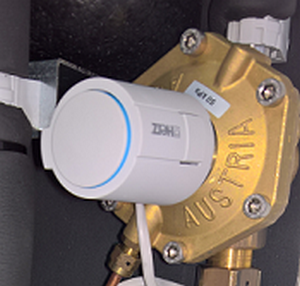 If the HIU is only supplying the space heating, then the primary flow to the heating system heat exchanger is controlled by a two port on/off actuated valve linked to a programmable room thermostat (Herz 3 F799 17). This valve will close when the room temperature setting has been achieved or when the heating system is not in use. If a hot water storage cylinder is being used, the common heating circuit from the secondary side of the heat exchanger divides and supplies the apartment heating system utilising a zone valve (supplied by others) which is controlled by a room thermostat. The common secondary heating circuit also provides primary heating to a hot water storage cylinder (not supplied). This circuit is controlled via a zone valve and cylinder thermostat (not supplied) which opens the zone valve when the cylinder temperature begins to drop. 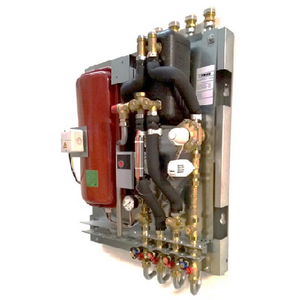 Both DHW and Secondary heating will work to the dictates of a central heating programmer. A combination valve consisting of a fixed spring differential pressure control valve set at 50kPa installed with an actuator which operates as a control valve. The differential pressure control valve sits across the primary flow and return and protects the temperature limiting valve and also stabilises the flow rate. The actuator is connected to the apartment heating controls and allows the primary heating to flow through the heat exchanger on demand. A temperature limiting valve is installed in the primary return to aid low primary return temperatures and maximise system efficiency. 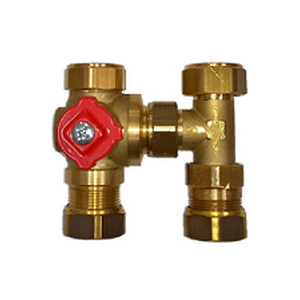 The valve controls the secondary flow temperature by means of a thermostatic head with a contact sensor attached to the secondary flow pipe. The Ecosse HIU can be fitted with a Herz HIU flushing bypass, this is a custom made valve designed to facilitate the flushing of the primary system without the water circulating through the HIU as recommended in BSRIA Guide BG 62/2015. The flushing bypass valve can be connected directly to the HIU ball valves at first fix so that primary flushing can be carried out before the HIU is fitted. The Ecosse HIU has the option to have a stand-off bracket installed to enable the services to be connected from the top of the unit. The top entry stand-off bracket enables any combination of services to be piped from above or below the HIU. Pre-formed, pre-insulated pipes, complete with all connections, are available to provide full flexibility.